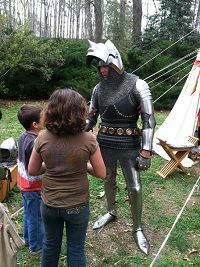 Young visitors learn how to dress a knight in the camp of “La Belle Compagnie” during Jamestown Settlement’s “Military Through the Ages,” March 2013. Photo: Jamestown-Yorktown FoundationLa Belle Compagnie is a living history group that presents the household and military company of the fictitious Sir Geoffrey Peel, a knight of Hampshire during the Hundred Years War between England and France (1337 to 1453). 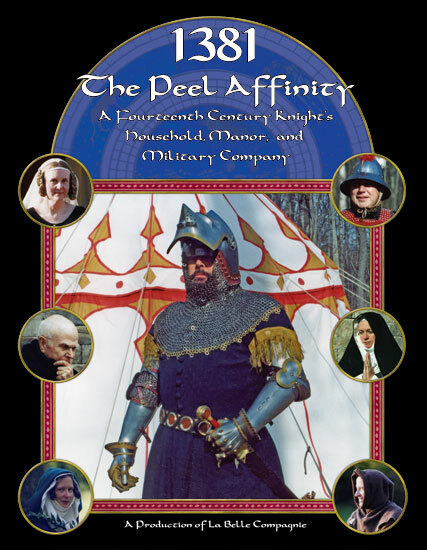 We portray the affinity of Sir Geoffrey, which includes his immediate family, archers, and men-at-arms, as well as family servants and their dependents. Check out the sub-menu of this section for more information about the Compagnie. La Belle Compagnie has been operating for over 20 years with a core membership in the greater Washington, D.C. region. While many of our members live in the Maryland-Virginia-D.C. area, we also have regulars in New York and Pennsylvania and occasional attendees from even further away. Our group participates in about 4-8 public events a year – usually in multi-period events such as Jamestown’s Military through the Ages but also in exclusively medieval venues such as Colonial Plantation’s Medieval Days. We are a diverse, family-friendly organization and welcome new members! – please see Join Us for more information. We also occasionally present programs at museums or local schools, and members regularly attend (and sometimes present at) academic gatherings such as the annual Western Michigan University’s International Congress of Medieval Studies. In 2013, members of La Belle Compagnie presented a full session titled How Shall a Man be Armed? with four armored knights demonstrating the evolution of armor during the Hundred Years War; we also assisted Greg Mele and members of the Chicago Swordplay Guild in an “annotated” recreation of a judicial duel. [Look here and here for more information about our activities and our Book]. La Belle Compagnie Inc. is a Virginia non-profit educational corporation whose mission is to present research into the actuality of the Middle Ages through the medium of living history presentations.